A brutal game in those days? Well, yes and no. In the first place in those days we had no sickly boys, brought up to box twenty rounds to a decision. In these times the fighters -- or at least they are called fighters -- try to evade punishment. A fighter of the old times figured on taking the gaff and giving it at the same time. 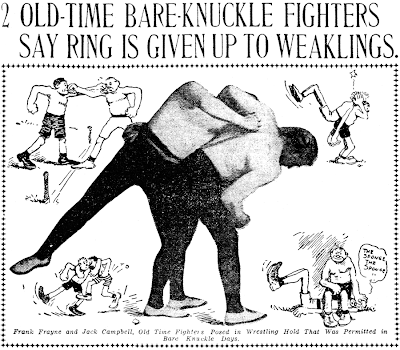 A man was properly trained in those days, and there have been more men killed in the ring in late years than there ever were in my day as a fighter. Why? Simply because fighting was not a business for a flat-chested, cigarette-smoking kid. It was a game for strong men who could stand up under punishment. Frank goes on to describe a fight he once had with Martin Murphy, arranged by a group of rich men who wanted to see a bare-knuckle contest. He talks about each fighter smearing their hands with rosin so that the blows would open raw wounds on the opponent's body. The fight was contracted for six rounds, but the combatants became so angry at each other they went eight, after which the underwriters begged them to stop, fearing that they'd kill each other. Yup, definitely the good old days. 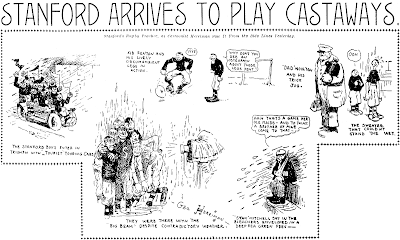 Saturday, October 5 1907 -- Rugby, generally not a very popular sport in the states, apparently flourished at the California universities in the 1900s. The coaches of the Stanford team were just back from a trip to Australia where they had gathered a whole new bag of tricks from the experts down under. The college's team was rumored to be a powerhouse as a result. The Stanford team arrived in L.A. in the middle of a downpour, but their fame preceded them and a group of club boosters showed up with cars to get them to the hotel. The players quickly changed into their gear and held a practice, despite the rain, so as not to disappoint a big crowd that had gathered to see them go through their paces. A number of college switched from football to rugby in 1906 after a rash of players died from football injuries. It was so much a big issue that President Theodore Roosevelt met with college presidents and demanded changes. Eventually, rules were established to make football what it is today. Yesterday our Obscurity of the Day was loaded down with mystery baggage -- today not so much! Cole Johnson makes everything clear. As you can see with his two samples above from the Omaha World-Herald, the syndicate was Hearst's Star Company imprint. So we can just forget that whole Pulitzer angle. 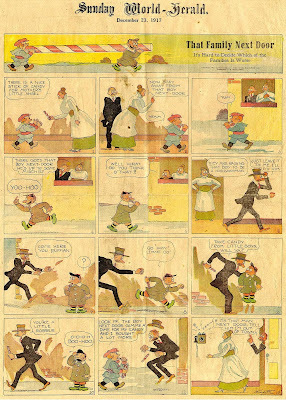 Secondly, Cole says That Family Next Door ended on June 30 1918 and was replaced the next week by Eddie's Friends, the Sunday version of Jean Knott's daily Penny Ante panel. And, just to throw in yet another wrinkle, as you can see with the second sample above, That Family Next Door was renamed to Mamma's Boy near the end of the run (the sample is dated May 13 1918). So That Family Next Door is a lot less of a mystery today. There are still unanswered questions though --- on what date did it change to Mamma's Boy and when did the series start? Cole has a December 23 1917 strip, and I have a different undated 1917 strip, but nothing definite there yet. I have that feature running in 1926-28, not 1923. Do you recall the paper where you found it running earlier? In the FAYETTEVILLE BULLETIN in October 1924.Also New York state. Is the Fayetteville Bulletin archived online or did you see it on microfilm/in print? Here's a strip that's got me puzzled. That Family Next Door was by Jean Knott, and ran in 1917-18. 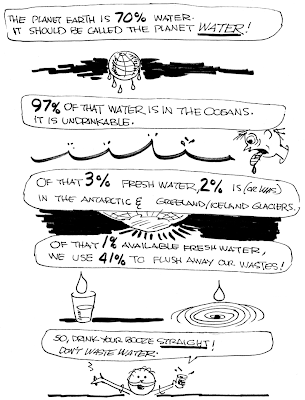 I have the grand sum of three examples of this rather generic strip in my collection, plus the one above which is a scan from Steven Stwalley (thanks Steven!). The mystery regards the syndicate. Jean Knott was in the Hearst stable throughout his comic-stripping career, so one would presume this to be a Hearst strip. The title header on the Sundays looks rather Hearst-y, too. There are a few problems with positively identifying it as a Hearst strip, though. First is that it didn't run in New York, so we have no positive ID based on the home paper. Second is that every example I've seen (total of four, you'll recall) has the same sort of copyright line as you see above, with the company unidentified. These two factors alone don't really amount to much, though. By 1917-18 Hearst produced more material than he had room to run in his New York papers, so the fact that it only ran outside of New York is immaterial, if not a point in favor of it being a Hearst production. The real problem regards the three examples I have in my collection. Sadly, all three are single sheets with no identification of the newspaper they came from. However, all three examples have Pulitzer strips running on the reverses, and Pulitzer footers on both sides (by footers I mean a rectangle running on the bottom of the sheet with a group of Pulitzer's comic strip characters cavorting together). Now that is certainly no guarantee that That Family Next Door is a Pulitzer strip, but three sheets that all have Pulitzer content surrounding our mystery strip was enough to tip the scales in my mind enough that my Guide listing for the feature credits Pulitzer. So what do you think? Do you have any additional evidence that might help to solve this mystery? EDIT: Mysteries solved, see this post. Isn't the type font in the "Copyright 1918" the same in the Hearst corp's "newspaper feature Syndicate'? The letters in the title (if not the logo)look much like those used in other b-grade Hearst offerings like Asthma Simpson. You wouldn't think that a feature whose main characters were drawn with a compass would make a big impression on readers, but Gelett Burgess' Goops enjoyed a surprising run of popularity in the early part of the previous century. In 1900 he published the book Goops and How to Be Them, in which he described the behavior of naughty children and accompanied each little poem with a cartoon of a globe-headed kid in the act of displaying their signature behavior problem. The concept caught on and the books became popular gifts from parents to their little monsters, er, children. Whether Burgess' Goop poems ever inspired these rugrats to straighten up and fly right seems doubtful, but the books themselves would at least serve as good paddling instruments if all else failed. At least four follow-up volumes were published between 1903 and 1916, and in that period Burgess branched out to produce a daily newspaper panel featuring his creations. The first Goops series was distributed by Associated Newspapers and the best documented dates I can offer are March 3 1913 through September 14 1915. After a long fallow period, Burgess resurrected his orb-faced brats in a second series that was distributed by the Chicago Tribune. This series ran from September 3 1923 to April 24 1926 as a daily panel, and as a Sunday comic strip from February 17 to May 18 1924. I hasten to add that all the information about newspaper appearances of the Goops that appears above is likely incomplete. I have found examples of Goops panels showing up in some of the darnedest places, often just running once or twice in newspapers as early as the oughts and as late as the 1940s. My tendency with most of these stray appearances is to chalk them up as reprints, old stock, specials distributed by a publisher on the occasion of a new book, and so on. But something gnaws at me that I'm still not getting the full picture of the Goop newspaper history. Perhaps there is some dedicated Goop-ologist out there who can fill me in. PS -- I am not the type of Goop-headed individual who goes around Googling my own name. I am, however, gripped by an intense fascination with the links you folks use to get here to the Stripper's Guide blog, and check my 'referrals' list on a regular basis. I see this not as ego massage but as market research, er, yeah, market research, that's it. To my constant dismay, a truly amazing number of my visitors arrive here hoping to find a very different kind of stripper ... but I digress. One of the referrals I just saw was from Wikipedia. Many kind (and discerning) folks have linked to this blog from various subjects there, so that was nothing out of the ordinary. What was unusual was the Wiki page from which this particular questing soul had arrived. It turns out, believe it or not, that there is a Wikipedia biography of li'l ole me! Really, I'm not kidding, you can go and look. And I swear on a stack of New York Evening Graphics that I didn't write it. So I'm walking around a little puffed up at the moment, realizing that I now stack up with such luminaries like Alexander the Great, George Washington, the guy who talked fast on toy commercials and the key grip on She Gods of Shark Reef. In observance of this great honor, I hereby promise to henceforth wear a tie whenever I write a blog post. If I ever make the Encyclopedia Brittanica I'll consider wearing pants, too. Congrats on the noteriety...but let's not hope for a world where bloggers have to wear pants...that's almost like having a real job. 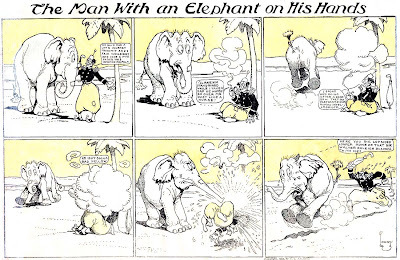 Here's one of my favorite comic strip titles, The Man With an Elephant on his Hands. Sounds like something Damon Runyan might have written about a loveable gangster who steals an elephant from a circus and then tries to unload it. 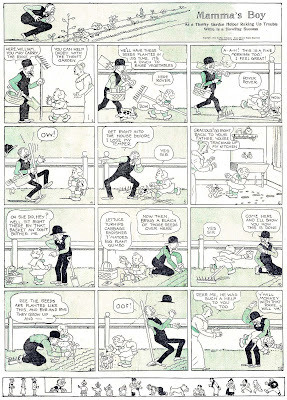 However, this strip is actually doing an homage (which sounds a lot nicer than a rip-off) to a song of the same name. The song was originally featured in the 1891 musical play Wang, a comedy about a Siamese monarch. 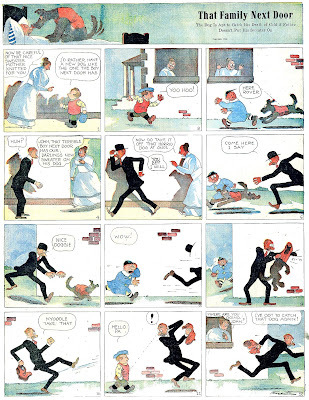 The play was revived in 1904, and apparently inspired cartoonist Everrett E. Lowry to do this strip. Yes, that really is how he spelled his first name. Lowry produced a lot of features for the McClure Syndicate. This one only ran from January 15 to March 19 1905, and came and went while he was producing no less that three other features for McClure. I don't think it's too hard to imagine that the short run of this strip came as a result of a 'cease and desist' letter. Lowry produced like mad for McClure during this period, but he was active much longer, and he really spread the wealth. His features appeared at one time or another with no less than seven different syndicates. Tip of the hat to Cole Johnson for the scan. Thanks Cole! Very nice art on that one! Yes, at first glance it does look very Seuss-like! Esp the 2nd panel of the elephant. Hello, Allan---This was the plot of several silent comedies as well. One featured an early appearance of Lon Chaney! In 1920, a company was formed, the "Elephant Producing Corporation", to make nothing but such comedies. They got as far as two, and went bankrupt. One of them, AN ELEPHANT ON HIS HANDS with Hughey Mack and Dot Farley, survives, and it's hilarious. Who can resist watching an elephant knock down hotel walls and squirting people with his trunk?---Cole Johnson.